Long Beach police are asking for the public’s help in connection to the possible kidnapping of a teenage girl in the city’s northside early Friday morning. Authorities said that at about 6:20AM today officers were dispatched to the area of Long Beach and Artesia boulevards regarding the possible kidnapping of a Hispanic girl, between 13 to 16 years old, by a black man about 30 to 40 years old. The 9-1-1 caller said they saw the man grab the girl by her waist and put her in the front seat of the van, Long Beach Police Department (LBPD) officials stated. 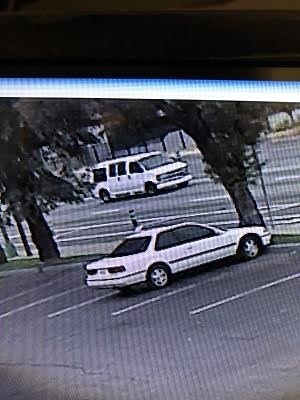 The suspect vehicle is described as a white 1996-2000 Chevy Express Passenger Van with windows all around. The window behind the driver has a sun shade with an upside down Honda logo and the back window of the van has a red “Temporary Registration” card with a white No. 6 on it. The vehicle’s plate has a decorative plate with “FMU” on it in possibly white and red. The man is described as being bald with dark skin, 6 feet, heavy set with a “beer belly”, wearing a red and white baseball cap and wearing a white, red and orange horizontal-striped polo shirt with a white shirt hanging below the polo shirt as well as light blue jean shorts that go past the knee. The victim is described as a light-skinned girl at 5 feet, 3 inches or 5 feet, 4 inches tall, with a thin build, short hair and wearing a black zip-up hoodie and black tight pants. Anyone with information is urged to call 911 or Homicide Detectives at (562) 570-7244. Anonymous tips may be submitted through “LA Crime Stoppers” by calling (800) 222-TIPS (8477).